Three-time Grammy® Award-winning and multi-platinum-selling artists Pentatonix have announced a 45-date tour produced by Live Nation to kick off their World Tour. Emmy Award-winning, multi-platinum-selling recording artist Rachel Platten will join as special guest on all dates. The North American dates will begin at Oracle Arena in Oakland, CA on May 11 and include stops at The Forum in Los Angeles and Madison Square Garden in New York City. Additional cities, countries and continents will be announced soon. Tickets for the tour will be available via a Patreon member presale running from Monday, Feb. 11 at 10 a.m. local time until Thursday, Feb. 14 at 10 p.m. local time. American Express® Card Members can purchase tickets in select markets before the general public beginning Tuesday, Feb. 12 at 10 a.m. local time through Thursday, Feb. 14 at 10 p.m. local time. Tickets will be available to the general public starting Friday, Feb. 15 at noon local time at ptxofficial.com. 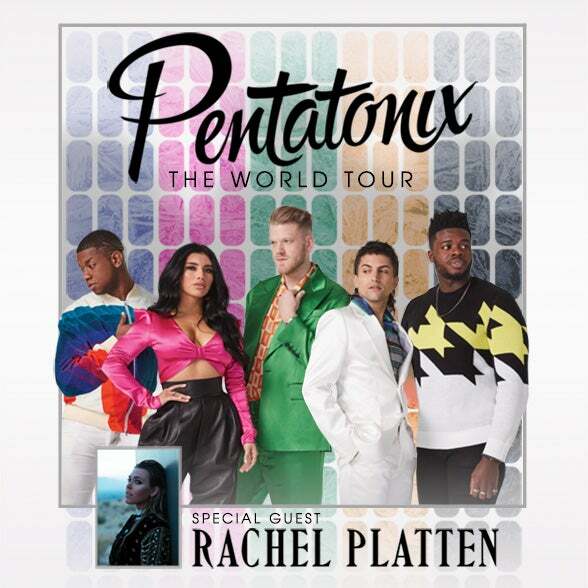 Three-time Grammy® Award-winning and multi-platinum-selling artists Pentatonix have sold nearly 10 million albums in worldwide consumption and performed for hundreds of thousands of fans at their sold out shows across the globe. Their YouTube channel boasts more than 15.5 million subscribers, yielding over 3.4 billion video views. Their 2015 self-titled album is certified gold after debuting No. 1 on Billboard's 200. Additionally, nine of their albums reached the top 10 on Billboard's 200 chart (two albums reaching No. 1) and received multiple RIAA certifications for multi-platinum, platinum and gold selling albums and singles. Their tracks "Mary, Did You Know?" and "Hallelujah" were certified platinum, while the Pentatonix original "Can't Sleep Love" was certified gold. The group has had two holiday specials on NBC, released their tour documentary "On My Way Home" in 2015 and appeared in the feature film "Pitch Perfect 2." In October 2017, Pentatonix released a deluxe version of their certified platinum 2016 holiday album, A PENTATONIX CHRISTMAS DELUXE, and completed their sold-out A Pentatonix Christmas Tour in December. The following year, in April 2018, Pentatonix released the first collection in the group's PTX Presents series, PTX PRESENTS: TOP POP VOL. 1, which features 11 PTX-curated modern pop performances, and they wrapped their 39-city North American tour in September. Most recently, Pentatonix released their fourth holiday album, CHRISTMAS IS HERE!, accompanied by a new single, "Making Christmas." Born in New York City and raised in Massachusetts, Rachel Platten is an Emmy Award-winning, multi-platinum-selling recording artist. Few artists in the past decade have struck a chord of hope and resilience like she did with her empowering hit "Fight Song." Listeners instantly adopted the transformative anthem as their own, linking fans' tales of personal empowerment across the globe. Rachel topped countless radio and iTunes charts worldwide with her major label debut album Wildfire which also included the platinum Billboard Hot 100 hit "Stand By You." In 2017, Rachel released Waves, which again delivered a searing, emotionally and socially relevant pop gem that has connected audiences and moved women to stand up for each other while also amplifying the power of individuality, "Broken Glass," as well as sultry, infectious "Shivers" and more intimate songs such as the bewitching "Collide." Most recently, while awaiting the arrival of Rachel's precious baby girl, she released "You Belong" as a dedication and anthem for expectant moms everywhere. Live Nation Entertainment (NYSE: LYV) is the world's leading live entertainment company comprised of global market leaders: Ticketmaster, Live Nation Concerts, and Live Nation Media & Sponsorship. For additional information, visit livenationentertainment.com.